During the Central West Steering Committee meeting on Monday, August 19th, the Steering Committee reviewed the work plan for the Central West Focus Area process. This work plan sets the dates and tasks for the meetings from August to November 2013. For the schedule for the upcoming Steering Committee and Advisory Board meetings, please see below. For a copy of the work plan, including dates and tasks, please click here. – Tuesday, September 10th – COMMUNITY EVENT – Time and location TBD – This will provide the community with an opportunity to offer feedback about the plan More information coming soon. – Wednesday, September 11th – Greenways Commission Meeting– 7:00pm at the Chapel Hill Library – The Greenways Commission will review the draft Central West Focus Area concept and provide comments. – Tuesday, September 24th – Bicycle and Pedestrian Board Meeting– 7:00pm in the 3rd Floor Planning Department Conference Room, Town Hall, 405 Martin Luther King Jr. Blvd. 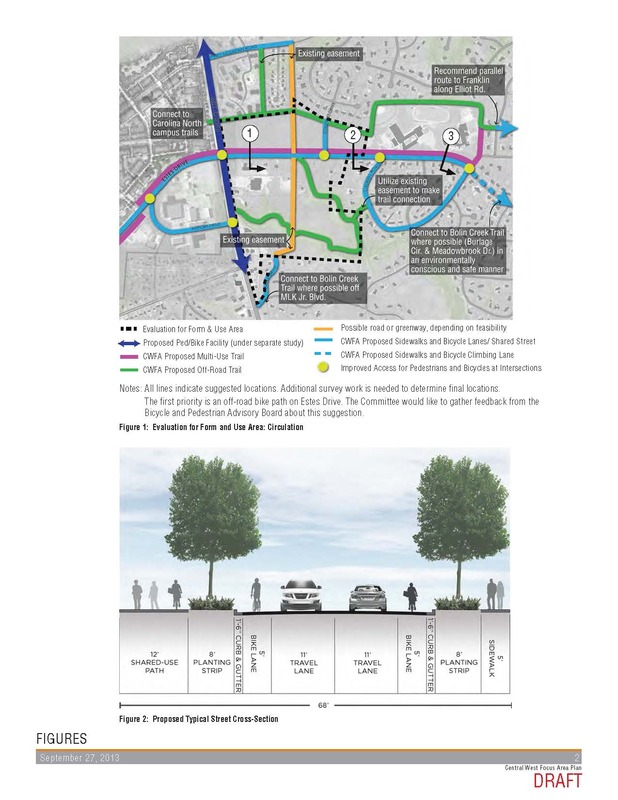 – The Bicycle and Pedestrian Board will review the draft Central West Focus Area concept and provide comments. – Thursday, September 26th – Transportation Board Meeting– 7:00pm in the Human Resources Training Room, Town Hall, 405 Martin Luther King Jr. Blvd. – The Transportation Board will review the draft Central West Focus Area concept and provide comments. – Tuesday, October 1st – Planning Board Meeting– 7:00pm in the Public Works Building 1, Training Room 131, 6850 Millhouse Road – The Planning Board will review the draft Central West Focus Area concept and provide comments. – Monday, October 21st – Council Public Hearing– 7:00pm in the Southern Human Services Center Complex, 2501 Homestead Road – This will provide the community with an opportunity to offer feedback about the plan. – Monday, November 25th – Town Council Meeting– 7:00pm in the Southern Human Services Center Complex, 2501 Homestead Road – The Town Council will consider possible adoption of the Central West Focus Area small area plan. For more information about the July 30th Central West Steering Committee meeting, please see below! The Central West Steering Committee met on July 30 at the Chapel Hill Public Library from 6:00 – 9:00 PM. Copies of all meeting materials can be found at www.townofchapelhill.org/centralwest All formal agreements of the Committee reflect the affirmative vote of at least 2/3 of the members present. 1. Opening Remarks: Megan Wooley began by sharing the goals for the meeting. She noted that Mary Jane Nirdlinger, the Town’s Director of Policy and Strategic Initiatives, would be filling in to help run the meeting during Loryn Clark’s absence. She also noted that there would be a special topic presentation given on Monday, August 12th from 7:00–8:30 PM at the Chapel Hill Public Library that might be of interest to Committee members. The topic is “Design for a Changing World: The New Practicality of Placemaking,” given by Victor Dover from Dover, Kohl & Partners. Megan also noted that she and David Bonk met with the Pastor and some parishioners from Amity Church on July 29th to discuss their vision for their property. They envision that the property will remain as a church for the next fifteen to twenty years, but they are open to considering some retail development, such as a coffee shop, on the site. Julie McClintock requested that a discussion of the status of the work plan be placed on a future agenda. After some discussion, it was decided that Megan will e-mail copies of the plan to Committee members, who can review it to see if they feel a discussion on updating it is warranted. 1. Community Participation: Several individuals from the community then shared comments/opinions with the Committee. 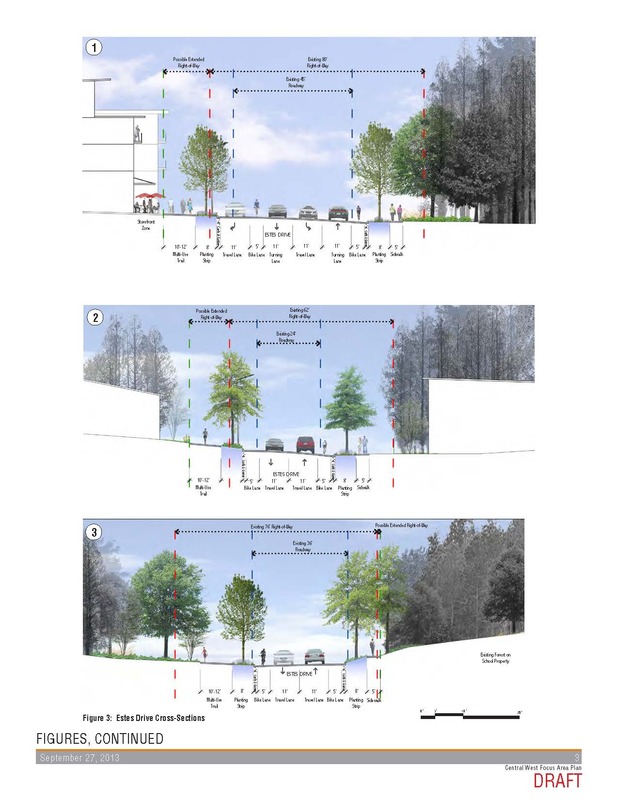 Plan for uses that give an active street front along MLK and Estes No “dead zones” – no parking lots visible from the street. Other specifics about parking will be addressed at a later time. Promote a coherent design relationship between new development on the east side of MLK and the future Carolina North campus. 5. Community Comment: The meeting concluded with comments from two community members. The next Central West Steering Committee meeting will be held on Monday, August 19th from 6:00-9:00pm at the Chapel Hill Library, 100 Library Drive. For more information about the July 22nd Central West Steering Committee meeting, please see below! Julie McClintock moved that the discussion of Principle 13 be shifted earlier in the agenda to follow Todd LoFrese’s presentation, so that the committee would be certain of having time to discuss it. The motion failed by a vote of 4 to 8. Several individuals from the community than shared comments/opinions with the group. 4. Transportation Overview: David Bonk, the Chapel Hill long range and transportation planning manager, gave a presentation on the existing transportation conditions in the Central West area, showed three possible road profiles for Estes Drive that would incorporate improved bike/ped facilities, and led the group through a sample exercise that showed how a trip generation analysis was conducted. He shared data from a rough estimate of trip generation from two of Rhodeside and Harwell’s June 4 concept plans—one at lower density with more residential (option 1 less 25%) and one at a higher density with more commercial (option 3). He noted that it was not possible to draw definitive conclusions from these initial estimates. 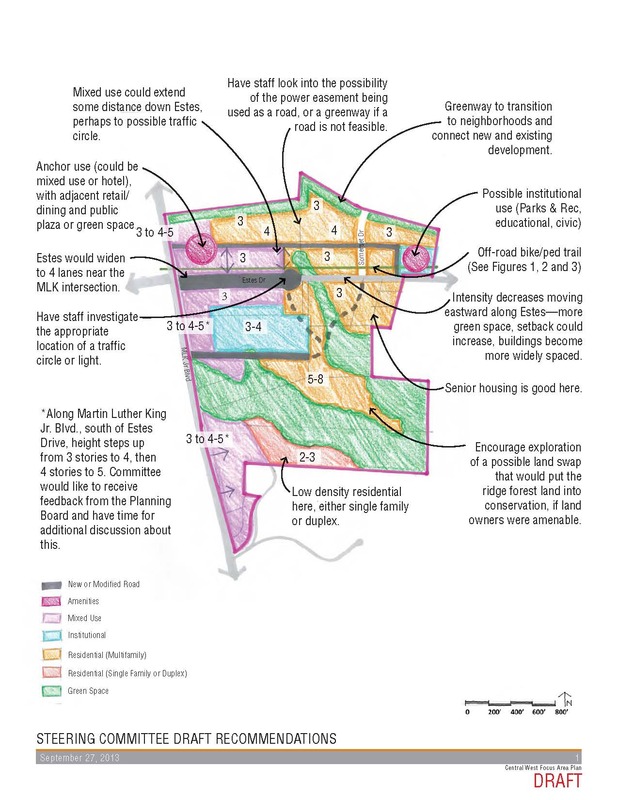 Specific land use plans—along with possible internal circulation solutions—will be needed before the impacts on Estes Drive and MLK Boulevard can be ascertained. The next Central West Steering Committee meeting will be on today, Tuesday, July 30th from 6:00-9:00pm in Meeting Room B at the Chapel Hill Public Library, 100 Library Drive. Interested in the Central West Focus Area process? Then check out these meeting summary notes from the July 1st Central West Steering Committee meeting! The next Steering Committee meeting will be tonight, Tuesday, July 9th from 6:00-9:00pm, in Meeting Room B at the Chapel Hill Public Library, 100 Library Drive. The meeting summary notes from this meeting will also be posted on this blog. 1. Remarks from Mayor Kleinschmidt: Following up on the co-chairs’ report to Council on June 24, the Mayor noted that Council reviewed the committee’s work to date positively and appreciates their hard work and willingness to tackle the difficult issues involved in reconciling stakeholder interests in the CW area. He encouraged the committee to complete its work in time for Council to vote on the final plan at its last meeting of 2013 but did comment that he felt that the Council might consider an extension to the timeline if specific tasks remain to be accomplished at that date and the committee proposes a timely plan for their completion. 2. Community Participation: Several individuals from the community shared comments/opinions with the Committee. 3. Council Liaison: The group welcomed Councilman Jim Ward as the newly appointed Council liaison to the committee. 4. Summary of Council Presentation and Comments: The co-chairs summarized the comments they received at the Council meeting from both Council members and the public. One issue that had been raised at the Council presentation – whether the group should consider using a facilitator – was brought to the table for discussion. The vote to request a facilitator failed (8 for and 8 against, one abstaining; the vote failed as it did not receive the required two-thirds majority of the 17 members present). 5. Discussion of Work Plan for Milestone 3: The co-chairs presented the plan for the final phase of the committee’s work, concluding in November 2013. The meeting dates were approved unanimously with the exception of July 18 and August 13; the August meeting has been rescheduled to August 7; Megan will take a Doodle poll for the best date to reschedule the July meeting. The committee also unanimously approved the Milestone 3 work plan as presented, with the understanding that the question of how many plans to move to the testing phase is still undecided. 6. Review of Homework Assignment and Discussion of Planning Areas: Using the information generated from the committee’s homework assignment (to outline their visions for uses, density, heights, and other considerations in the ten different sectors of the CW planning area), the group had a lengthy discussion to identify the areas of consensus and disagreement in sectors A–C (the other sectors will be discussed at the 7/9 meeting). Loryn Clark acted as facilitator. At the end of the session, the group evaluated the discussion format. The committee agreed that Loryn’s facilitation had been very helpful and decided to involve her in subsequent meetings. A request was made to have the planning principles displayed during the next discussion and to explore working with a designer at subsequent sessions to support the committee’s decision making. 7. Community Comment: The meeting concluded with comments from several community members. Thanks to everyone who attended the meeting and to the committee for their continued hard work.